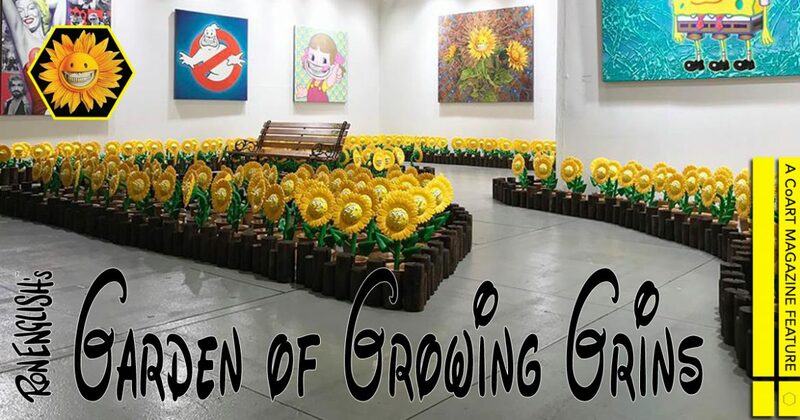 Artist Ron English‘s 2011 painting Growing Grins (pictured right) depicts three surreal sunflowers, surrounded by a colorful array of his Telegrinnies characters. Of the three plant heads included, only two reveal their reimagined visage: one featuring an iconic smiley face, while the other twists that same form with English’s well-known “grin” element. Conceiving the third head to be modelled after his recent 3 Eyed Sponge (2017) painting, a twisted parody of SpongeBob SquarePants with a trio of eyes and legs as well as two noses, this concept became the basis for English’s Garden of Growing Grins sculptural installation. Setup as a subversive stroll through a popaganda park, the skyline is decorated with a variety of English’s paintings, including the two that inspired the Sun Flower Sculpture pieces, as they are individually titled. As for the Garden of Growing Grins, they are perfectly situated behind faux retaining walls, hugging the outlining installation edges as well as creating an island of smirks in the middle. And amidst this inner cluster is a classically styled wood bench, decorated with a single smiley grin sticker, that intices attendees to sit down and take in the pop art grandeur. 16½ × 10¼ × 8¼ in. English’s Garden of Growing Grins installation made its public display debut at Art Fair Tokyo, as part of JPS Gallery‘s booth N21. After a VIP preview held on March 16th, the installation was on display the duration of the art fair (March 17th to 19th, 2017).